On February 17-18, in the city of Kryvyi Rih, Dnipropetrovsk Oblast, a seminar on guides preparation for the traveling educational exhibition “Everyone Has the Right to Know Their Rights” was held. The event took place at the secondary school №111 of Kryvyi Rih City Council of Dnipropetrovsk Oblast. 15 school students participated the seminar. For the following two weeks, they will be not only guides of the exhibition, but also try to moderate a discussion platform for their peers. Relaxed atmosphere prevailed at the seminar. 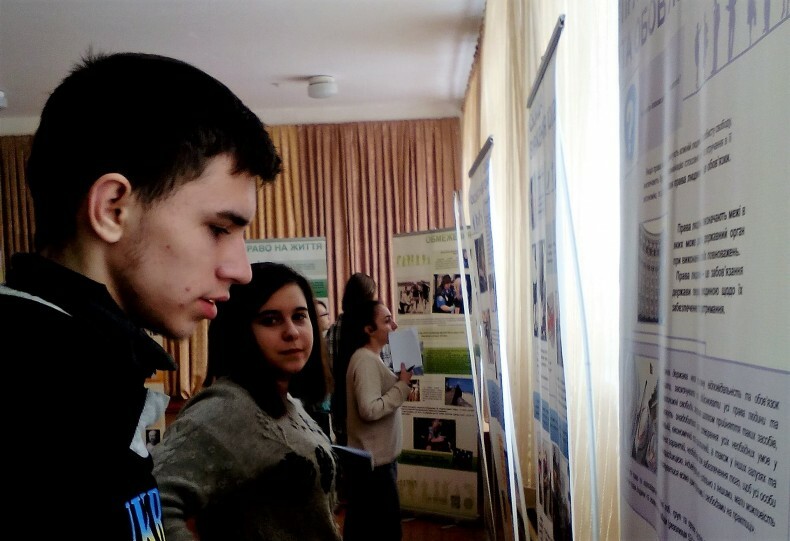 During the event, participants get to know 25 exhibition stands that contain statements of famous people and young activists who defend human rights; pictures and drawings; information about historical facts; quotations from documents and decisions of international human rights and more, providing a wide field for discussion and for raising awareness about human rights. 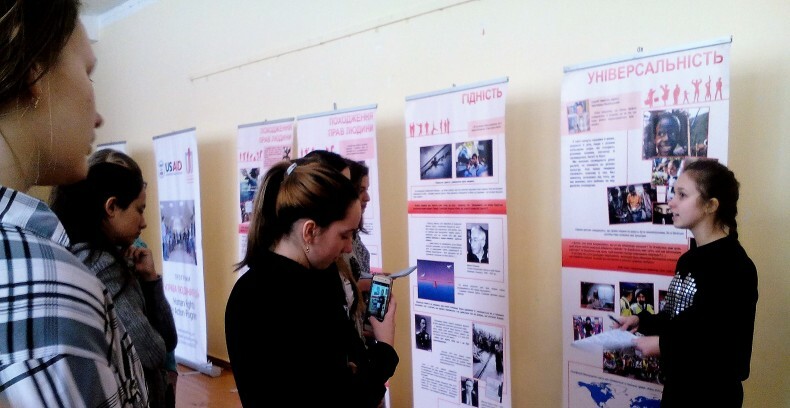 The traveling educational exhibition “Everyone Has the Right to Know Their Rights”, as well as the guideline to work with it, were developed in 2011 by the NGO “MART” (UHHRU member organization) MART http://mart-ngo.org.ua/ua with the support of the International Renaissance Foundation http://www.irf.ua/i using expert materials. It was prepared under the action plan of the Ukraine-wide Educational Program “We Understand Human Rights” http://edu.helsinki.org.ua/, as one of the steps to respond to the need for a systematic approach to human rights education. It enables to use these products as auxiliary materials for learning and encourage discussion of human rights issues. NGO ‘MART’ is a non-political non-profit organization, focusing on civil society development, as well as human rights education, monitoring of human rights observance, public interests advocacy through mechanisms of human rights protection. This model of a traveling exhibition is a methodological tool for human rights education, but its strength is that it allows you to attract the attention of a wide range of people to the problems related to human rights, to mobilize local communities, and to influence formal education. Also, its feature is that the excursions to the exhibition are guided by young senior secondary school students, students who have received special training on a peer-to-peer basis. The educational tour lasts 40-60 minutes and includes both direct information and training unit. It discusses the most important human rights issues and possibilities of settling with visitors. Thus, the exhibition becomes a kind of platform for discussions on human rights and real issues of concern to each visitor and the community as a whole. The seminar on guides preparation of the traveling educational exhibition “Everyone Has the Right to Know Their Rights” was organized within the framework of initiatives implemented by the Ukrainian Helsinki Human Rights Union the Human Rights First project supported by Global Affairs Canada and the US Agency for International development (USAID) Human Rights in Action programs, a part of the national educational program “We Understand Human Rights”.